Dubai, UAE. 17th February 2019: Kasih Food Production Co., one of leading food manufacturing companies in the region, revealed its latest food innovation, Mezete, at the largest annual food & beverage trade show in the region, Gulfood 2019. For the first time, Mezete has exhibited its line of products at the exhibition which took place at Dubai World Trade Centre in Dubai, United Arab Emirates, during the period February 17 to 21, 2019. Mezete is a first of its kind food innovation breakthrough that offers consumers ready-to-eat high quality, healthy and nutritious line of products and convenient food solutions. Mezete's offerings include a variety of East Mediterranean signature dishes including Hummus with various toppings, Fava Beans, Qalayet and Mulukhiyah. Mezete's products possess all-natural ingredients and no preservatives and kept unrefrigerated with an 18-month shelf-life. Kasih Food Production Co. has achieved this using pioneering innovative technologies and extensive expertise in production and packaging solutions, making it a first-of-its-kind in the region's food industry. Initially, Mezete is being launched in Jordan as of February 2019, and planned to reach regional and global markets by the end of the year. Given the continuous domestic growth of its food and beverage consumer market and the countless global opportunities it offers, the UAE market will feature Mezete during the second half of 2019. 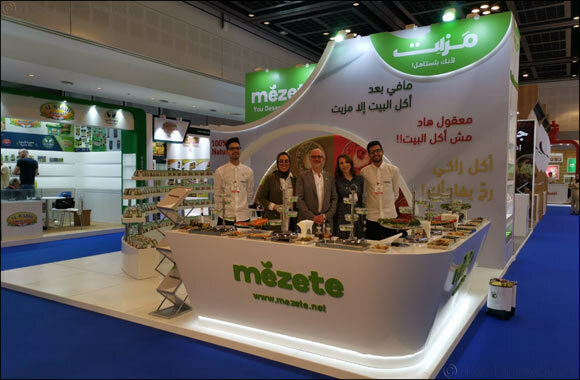 A leading food producer in Jordan, Kasih Food Production Co. brought innovation and food manufacturing expertise to the frontline, exhibiting Mezete to nearly 100,000 visitors from around the world. “Being at Gulfood is very important to us. It is one of the region's biggest platforms for engaging with business partners and experts in the food and beverage industry, as well as a touchpoint to meet potential distributors that will allow us to deliver our new innovative food solutions to consumers around the region and beyond,” added Kasih. As a Jordanian pioneer in food manufacturing, and internationally recognized for its Arabic food innovations, Kasih Food Production Co. is a regular exhibitor at global and regional food and beverage similar trade shows such as Anuga Food and SIAL exhibition, representing Jordan's food production industry and its many innovations. This year marked the 24th edition of Gulfood, gathering 98,000 visitors from 193 countries, including government officials, industry experts, master chefs, and many suppliers and distributers in the food and beverage industry. The annual exhibition hosts the latest innovations that reflect the changing consumer needs.